Parasites are a group of eukaryotic organisms that may be free-living or form a symbiotic or parasitic relationship with the hosts. Consisting of over 800,000 recognized species, parasites may be unicellular (Protozoa) or multicellular (helminths and arthropods). The association of parasites with human population started long before the emergence of civilization. Parasitic zoonotic diseases are prevalent worldwide including India. Appropriate epidemiological data are lacking on existing zoonotic parasitic diseases, and newer diseases are emerging in our scenario. Systemic diseases such as cysticercosis, paragonimiasis, hydatidosis, and toxoplasmosis are fairly common. Acquired Toxoplasma infections are rising in immune-deficient individuals. Amongst the ocular parasitic diseases, various protozoas such as Cystoidea, trematodes, tissue flagellates, sporozoas etc. affect humans in general and eyes in particular, in different parts of the world. These zoonoses seem to be a real health related problem globally. Recent intensification of research throughout the world has led to specialization in biological fields, creating a conducive situation for researchers interested in this subject. The basics of parasitology lie in morphology, pathology, and with recent updates in molecular parasitology, the scope has extended further. 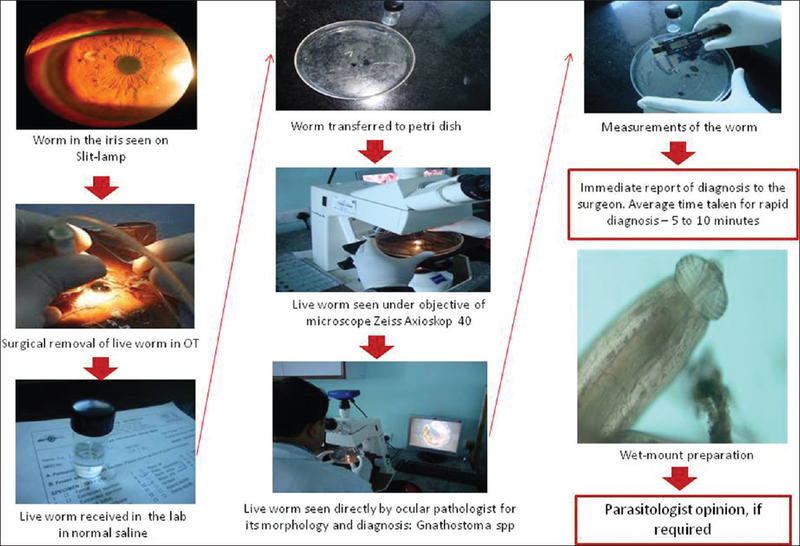 The current review is to address the recent update in ophthalmic parasites with special reference to pathology and give a glimpse of further research in this field. Ocular parasitology is the study of parasites that pass on a disease to humans and results in ophthalmic complications., Parasitology was born as a tropical step-sister of medicine but has become a well-known scientific subject in its own right in these times of global awareness. In the past decade, parasitology has undergone significant transformation. The causative organisms of parasitic diseases depend on reproduction as a prime function for survival in the definitive host. Many progenies are needed to overcome the mortality during transmission of organism to pass on its reproductive character to the next generation.,, The host is deprived of vital resources and nutrients which the parasites utilize during their reproductive stages. The consequence of these changes is local or extensive damage to the host tissue, and if these become more severe, there is noticeable deterioration of the host who is then referred to have systemic involvement of parasitism. The authors have found a unique method of detecting the live parasites under the compound microscope objectives (Zeiss, Axioskop 40) and documenting them digitally (AxioCam MRc). The entire internal structures including intestine, spine, and striations could be instantly identified under background illumination, and the immediate diagnosis can be communicated to the surgeons. The entire exercise of diagnosis can take 5-10 min from the time of receiving the specimen. 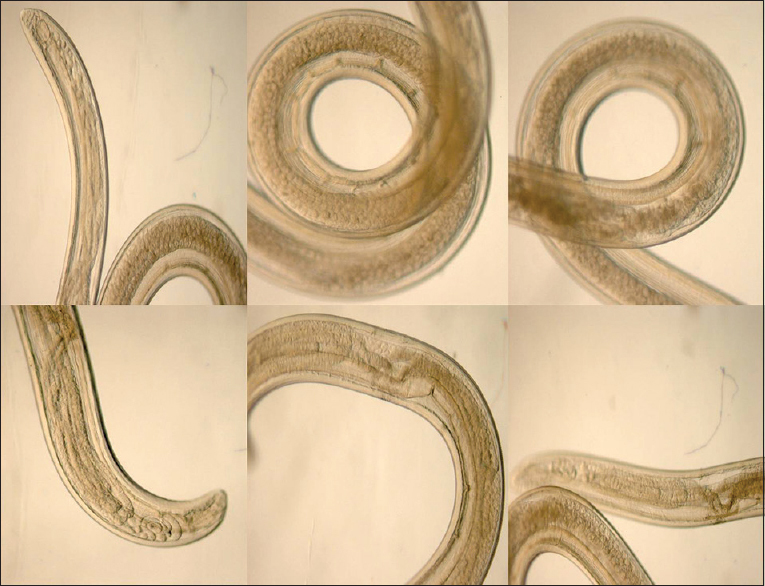 Since the management protocol of different worms vary from one another, urgent diagnosis can help overall management of the patient. These were compared with wet-mount preparation of the parasites. Sometimes, opinion of a parasitologist was taken to confirm the diagnosis [Figure 1]. The relationship between a parasitic organism and its host's immune system is an extremely complex one., Various pathologies of ophthalmic parasites causing infections in eye and adnexa have been described with newer advancement. 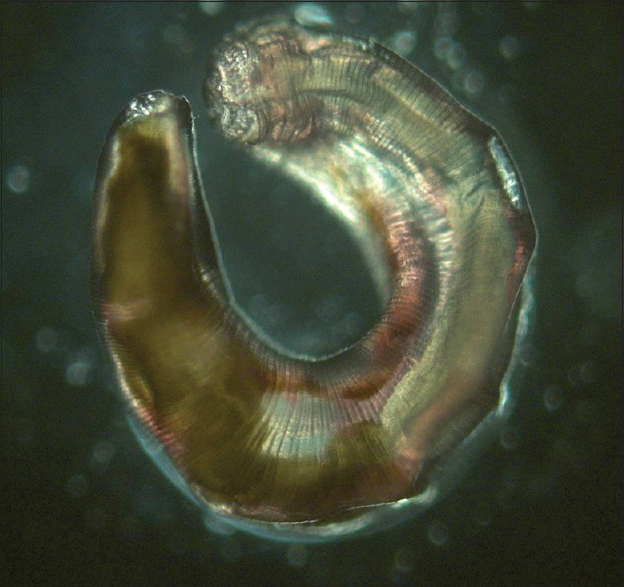 Ocular toxocariasis is caused predominantly by Toxocara canis, a nematode for which humans serve as intermediate hosts. Ocular toxocariasis is usually unilateral and can have several myriad clinical presentations ranging from diffuse endophthalmitis, posterior pole granuloma, peripheral localized granuloma, peripheral or macular disciform retinal detachment to pars planitis, or papillitis. Tissue damage occurs in this infestation due to mechanical effects of the migrating larvae or secondary to immune reaction. In tissue sections on histopathological examination, circumscribed granulomatous reactions with neutrophil and eosinophil infiltrates are seen sometimes with the larvae located in the center of the reaction. The central area of recent lesions may show fibrinoid necrosis whereas older lesions may reveal fibrous encapsulation. Giant cells, epithelioid cells, macrophages, and lymphocytes are usually present around degenerating larvae. The Splendore-Hoeppli phenomenon denotes eosinophilic precipitate that can be observed around the Toxocara larva but is a nonspecific finding. Ocular toxocariasis should be considered in the differential diagnosis of unilateral neuroretinitis with subsequent motile retinal lesion. Some studies suggest that seroprevalence of antibodies to Toxocara is high in patients with ankylosing spondylitis-associated uveitis. Ocular toxocariasis can cause cataract with distinctive features which show a granuloma-like opacity primarily at the posterior subcapsular level. It also simulates retinoblastoma (pseudoretinoblastoma) in some cases. It is a tissue infection caused by the larval form of Taenia solium (cysticercus cellulosae). Ophthalmic cysticercosis causes features such as loss of vision, periorbital pain, scotoma, and photopsia. Other modes of presentation of the disease may be neurocysticercosis or subcutaneous or muscular cysticercosis. The cyst may be localized to the subconjunctival space or orbit or may invade the globe and present in anterior or posterior segment. Retinal involvement causes hemorrhages and edema. Histologically, the necrotic cysticercus is surrounded by a zonal granulomatous inflammatory reaction with an abscess that contains eosinophils. The vesicle wall exhibits hyaline degenerations, inflammatory cell infiltration, neuroglial fiber, and glial cell proliferation layers from the inside to outside. Death of the larva leads to marked immunological reaction and severe endophthalmitis [Figure 2], and parasite can be demonstrated in eye and adnexal structures [Figure 3]. Cases of submacular parasite masquerading as posterior pole granuloma have been reported. Rarely, a degenerated cysticercus cyst with chronic inflammation may simulate intravitreal infection. It can also present as fibrinous anterior uveitis with secondary glaucoma; the uveitis resolves with removal of the cyst. It is an infectious tropical disease caused by the parasite Onchocerca volvulus and transmitted by fly of genus Simulium. The exact pathology of the disease involves interplay between the inflammatory response and the host immune response. The larvae migrate in the body for 1 year before they settle in a nodule. The ocular lesions are primarily caused due to living, dying, as well as dead microfilariae. Ocular manifestations of onchocerciasis include punctate keratitis surrounding dead microfilariae, sclerosing keratitis, anterior uveitis with secondary cataract and glaucoma, chorioretinitis, and papillitis with severe constriction of the visual fields. The inflammatory reaction surrounding these microfilariae is also associated with edema and infiltration by eosinophils., There is a predominance of CD8+ suppressor T-cells and increased major histocompatibility complex class II expression along with increased IL-4 and messenger RNA. Autoantibodies against retinal S antigen, interphotoreceptor retinoid-binding protein, and inner-retinal and retinal photoreceptors were found in ocular fluids suggesting autoimmunity as a mechanism of the pathogenesis. Role of a unique biomarker, N-acetyltyramine-O, beta-glucuronide, a neurotransmitter derived metabolite from the parasite, for diagnosis of the disease has been investigated. Although commonly seen in Sub-Saharan Africa and parts of South America, a rare case of onchocerciasis was reported in India where the worm was extracted from the eye. The oncospheres of dog tapeworm Echinococcus granulosus sometimes form a hydatid cyst that contains larval form of tapeworm. In humans, tapeworm has a predilection for the orbit. The tapeworms appear as multiple scoleces provided with hooklets. Histologically, multiple scoleces are seen adjacent to a thick, acellular, amorphous membrane that represents the wall of the cyst. The presence of interferon, tumor necrosis factor-alpha, and IL-6 is observed in cases of human hydatidosis. Surgical removal of the cyst is followed by a rapid decline in cytokine levels. Sometimes, the cyst may be primarily located within an extraocular muscle and produce painful eye movements. Therefore, it should be considered in differential diagnosis of all solitary cystic enlargements of muscle. Polycystic Echinococcus is a variety of the disease thought to be an entirely new entity or an unrecognized form of orbital echinococcosis. Pathologically, this condition presents as multiple cysts of various size in a fibrous capsule. The cysts had been observed by the authors, and after doing the differential stain, it was seen that the wall had numerous small pores in the laminated portions. These were thought to be the passage for solutes to pass microfluidics to and fro from the cyst wall maintaining the in vitro and in vivo pressure within the cysts [Figure 4]. There was no such finding reported in literature under compound microscopy findings. Some pathologists stain hydatid cyst wall with lectins which brilliantly stain the structures. Also called unilateral wipe out syndrome, it is caused by more than one type of motile, subneural retinal, nematode roundworm. It is classically described as a unilateral condition characterized by insidious loss of vision, usually severe in nature. Associated features include vitritis, focal and diffuse pigment epithelial disturbance, retinal vessel narrowing, optic atrophy, and subnormal electroretinogram findings. Diffuse unilateral subacute neuroretinitis (DUSN) is now believed to be caused by small number of different nematode larvae. The first pathological change secondary to nematode larva infestation presents as granulomas in the whole globe. There have been variable sizes of worms detected and reported with longer worms leaving a tract of coarse clumping of pigment epithelium. The shorter worms predispose to leave focal, chorioretinal atrophic scars. Earlier the causative organism was thought to be T. canis, but Baylisascaris procyonis and the trematode Altaria spp. have also been suspected to be involved. The focal chorioretinal white spots are an immune response to a secretion or excretion from the worm. Worms, regardless of species, have been observed in the eye for up to 3 years. The role of optical coherence tomography in detecting nerve fiber layer atrophy and edema is under evaluation. Studies have also reported anatomical and functional evidence of both inner and outer retinal dysfunction in DUSN, even though the worm is usually located in the subretinal space. A macular cyst has also been seen to be an associated finding in DUSN. It is a rare parasitic disease caused by third-stage larvae of Gnathostoma species which incidentally affects humans after intake of raw meat of any definitive host such as fish, cats, dogs, and wild animals. Gnathostoma spinigerum is the most common species that affects the human eye. Clinical features of the disease may be cutaneous and visceral, including ocular involvement. Ocular manifestations of the disease are seen due to migration of the larvae as well as host response to the toxins. The most common presenting feature is anterior uveitis.,, Other features include lid swelling, iritis, iris atrophy, iris holes, intraocular hemorrhage, retinal scarring, retinal detachment, and rarely glaucoma. Intravitreal gnathostomiasis is a very rare entity. Reports of macular scarring or retinal tear with choroidal hemorrhage near the optic disc point to the posterior retina as a possible route of entry to the eye. The larva of Gnathostoma is identified by the number of rows and features of hooklets in the head [Figure 5] and [Figure 6]a, b. The parasite had a head bulb and a tapering body. The head bulb had four circumferential rows or hooklets, each row containing 40-50 hooklets. 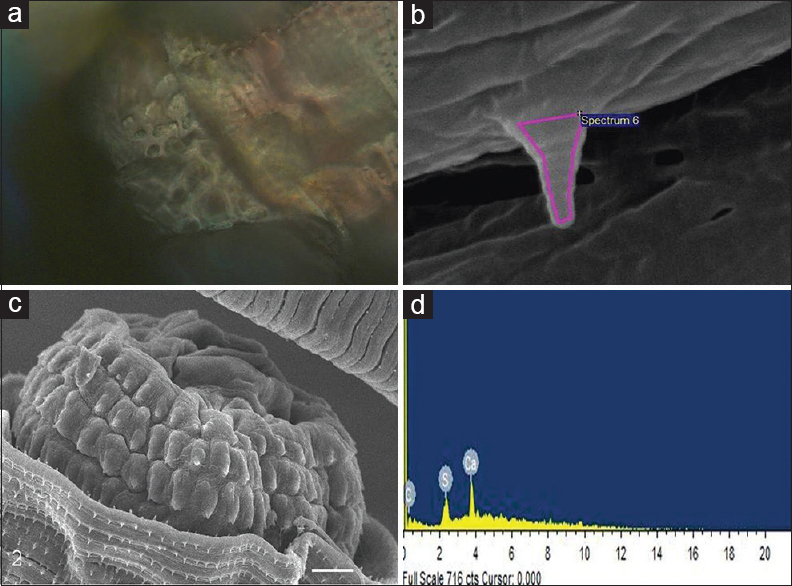 Further, scanning electron microscopy (SEM) and energy dispersive spectroscopy of spine showed carbon, calcium, and silicon deposition which was an interesting observation by the authors [Figure 6]c and d.
It is an insect-mediated ocular disorder caused by botfly larvae (order Diptera). Ophthalmomyiasis is characteristically unilateral and the patient complains of tearing, eyelid twitching, ocular irritation, and redness. Ophthalmomyiasis can affect external or internal ocular structures and in the latter, mostly subretinal involvement is seen [Figure 7]. The ocular surface disease is primarily due to mechanical injury caused by the maggots and its oral hooks and intersegmental spine. Small conjunctival hemorrhages may occur as a result of tissue damage from oral hooks. Subretinal tracts are representative of mechanical injury to retinal pigment epithelium. Damage to optic nerve, secondary macular hemorrhage, and retinal detachment has been reported. The death of the larva can cause uveitis. The vitreous contains lymphocytes, eosinophils, plasma cells, and epithelioid cells. Case reports of rare cases of secondary myiasis of ocular infestation by Chrysomya bezziana as well as reports of external ophthalmomyiasis caused by the facultative parasite, Lucilia sericata, in a healthy patient are present in literature., Another case of external ophthalmomyiasis due to Dermatobia hominis masquerading as orbital cellulitis was reported. Microscopic examination of these cases revealed nonnecrotising granulomatous inflammation surrounding parasitic structures. Dense infiltration by eosinophils seen with distinct areas of Splendore-Hoeppli phenomenon was noted. Cases of external ophthalmomyiasis may present with features of conjunctivitis varying from mild to severe. It is a rare disorder caused by Dirofilaria spp., a dog tapeworm and transmitted to humans by mosquitoes. Ophthalmic involvement may be periorbital, subconjunctival, sub-Tenon with intraocular association. Sometimes, it may be associated with a deep-seated infection such as in the lungs where early and proper diagnosis may prevent major complications. Identification of the worm can be done after surgical removal using standard histopathological methods [Figure 8]. The immature female worm is said to have thick laminated cuticle, broad lateral chords, and female genital system. Sometimes, it can mimic a lacrimal sac mucocele, and biopsy is diagnostic in such cases. It is also suggested that all patients of multifocal choroiditis in endemic countries should be checked for retinal pigment epithelial tracts to rule out parasitic infestation. Intravitreal dirofilariasis is also a rare occurrence. Loiasis is a chronic disease caused by filarial parasite, Loa loa. It is endemic in the rain forests of Africa. The infection occurs by the bite of infected mangrove flies, Chrysops silacea. The disease is characterized by two major forms, calabar swelling which is localized angioedema caused by hyperemic reaction to adult worms, and subconjunctival migration of filarial worm. The presence of the worm in the subconjunctival tissue leads to itching, foreign body sensation, and mild hyperemia. A dead worm may induce an acute periorbital angioedema and conjunctival nodule formation. Intracameral migration of the worm is usually well tolerated. After the worm dies, the eye may show signs of extensive iridocyclitis associated with cloudy aqueous, vitreous opacities, and raised intraocular pressure. There have been few reports of posterior segment involvement. Extensive hemorrhagic lesions associated with retinal detachment, retinal neovascularization, vitreous hemorrhage, and subretinal exudates are seen. The presence of multiple yellow exudates throughout the retina, and occluded arterioles have also been reported. Other systemic manifestations include nephropathy, cardiomyopathy, arthritis, lymphangitis, peripheral neuropathy, and encephalopathy. A definitive diagnosis requires the detection of microfilaria in peripheral blood, urine, or other body fluids. The worm is identified by its filiform, cylindrical semi-transparent body with numerous round and smooth protuberances, and a blunt tail. The cuticle is covered with small bosses, which distinguishes L. loa from other filarial parasites. Pronounced eosinophilia is seen in association with liberation of microfilaria from the female worm. Cutaneous leishmaniasis may occur on the eyelids where it presents as a swelling, papule, plaque, nodule, or ulcer. The differential diagnosis of eyelid leishmaniasis includes cysts, chalazion, basal cell carcinoma, tuberculosis, syphilis, and sarcoidosis., Ocular manifestations include ptosis, lagophthalmos, lower eyelid ectropion, lacrimal discharge, ulcerative blepharitis, blepharoconjunctivitis, nodular episcleritis, scleromalacia, ulcerative interstitial keratitis, anterior uveitis, and macular hemorrhage. Biswas et al. reported a case of spontaneous resolution of bilateral macular hemorrhage in a patient with kala azar. Histopathological examination shows the presence of inflammatory infiltrate consisting mainly of lymphocytes, histiocytes, and plasma cells. Numerous intracellular and extracellular Leishman-Donovan bodies are also seen. Pediatric presumed trematode infection has been reported in patients from South India who were exposed to pond water. The parasite was identified as Philophthalmus. Morphologically, these trematodes are a few millimeters to 75 mm in size. The external body surface, referred to as a tegument, is made up of an external plasma membrane and an internal trilaminated plasma membrane. The extraocular manifestation includes dermatitis which was self-limiting. The ocular manifestations seen are subconjunctival nodules, anterior chamber nodules, and granulomatous uveitis. Histologically, the nodules show eosinophilic infiltration admixed with chronic inflammatory cells and a specific inflammatory reaction known as Splendore-Hoeppli phenomenon. This phenomenon is characterized by a central deposit of granular, acellular eosinophilic material surrounded by eosinophilic leukocytes, epithelioid cells, histiocytes, and lymphocytes. The acellular eosinophilic material may represent deposits of eosinophil basic protein, immune complexes, or both. These complexes are believed to be complementing products and immunoglobulins directed at antigens derived from parasites. Occasionally, teguments of parasite may also be seen. Malaria is caused by Plasmodium species and is transmitted by female anopheles mosquito. The most common forms of Plasmodium species are Plasmodium vivax and Plasmodium falciparum. Ocular complications in patients with malaria have been reported in 10% to 20% of patients. The most common complications noted in the acute phase are conjunctival hyperemia and subconjunctival hemorrhage. Yellow pigmentation of the conjunctiva occurs due to breakdown of erythrocytes. Other ocular lesions include retinal hemorrhages, transient ocular nerve palsies, orbital edema, choroiditis, retinal embolism, papilledema, paralysis of the pupillary light reflex, and accommodation. Herpetic keratitis due to immune dysfunction can also develop after malarial infection. P. falciparum malaria has the unique feature of being sequestered in the capillary and venule microvasculature and occludes the lumen by cytoadherence and rosette formation. The cytoadherence mechanism is mediated by the development of ligand-associated "knobs" on the surface of infested erythrocyte membranes., This ultimately leads to thrombosis, occlusion, and hemorrhage. The malarial pigment is an amorphous, chemically nonstructured component that presents microscopically as black to dark brown granules. Hemozoin is a complex crystalline polymer formed from heme, incidental to hemoglobin digestion within the digestive vacuoles of replicating trophozoites, and schizonts within host erythrocytes. Under polarized microscopy, the hemozoin polymer produces birefringence. This was first reported by Schaudinn in 1903, and is now regarded as diagnostic of malaria. The presence of ocular lesions in malaria indicates poor prognosis, especially in patients with cerebral malaria., Thus, a patient with unexplained large retinal hemorrhages should be investigated thoroughly for malaria, especially in an endemic country such as India. An unusual parasitic disease was reported by Malla and Upadhyay et al. in Nepal., This was severe panuveitis which does not have a known cause and is usually unilateral. The disease started acutely with red eye and white pupillary reflex with occasional pain. There was fibrinous uveitis in the anterior chamber with hypopyon. Histopathologically, the evidence revealed severe inflammatory reaction with predominance of lymphocytes and plasma cells. The retina was drawn up into a retrolenticular mass. Eosinophils were not observed in the studied section. SEM of the specimens showed Russell bodies and plasma cells. Kathil et al. found varicella zoster virus in the intraocular fluid of a patient with seasonal hyperacute panuveitis. Ocular infection of amoebae depends on inoculation of a virulent protozoan present in the environment. Amoebae reach ocular surface through contaminated touch, contact lens, or trauma., IgA and IgA-dependent protective factors often counteract the infective process and are usually sufficient to kill the parasite. Sometimes, cornea remains susceptible to amoebic infection, particularly Acanthamoeba. Trophozoites in cornea express the major virulence of trans-membrane protein called mannose-binding protein., This protein mediates adhesion of amoebae to the corneal surface. After attachment, the amoebae produce metalloproteases and induced cytopathic effect by killing the host cells. Another possible factor in the pathogenicity is the presence of bacterial colonization of the ocular surface. Endosymbiosis with bacteria is also observed in Acanthamoeba. Histopathology of the affected part shows the presence of neutrophilic presence which is followed by macrophages. There is almost complete absence of lymphocytes. Necrosis is seen with the absence of neovascularization. In advanced cases, an immune ring (Wessely ring) results from the deposition of immune complexes. Amoebae particularly Acanthamoeba can cause keratitis, scleritis, and uveitis, and late complications include ocular hypertension and cataract. In vivo confocal microscopy can be used to detect the organism. 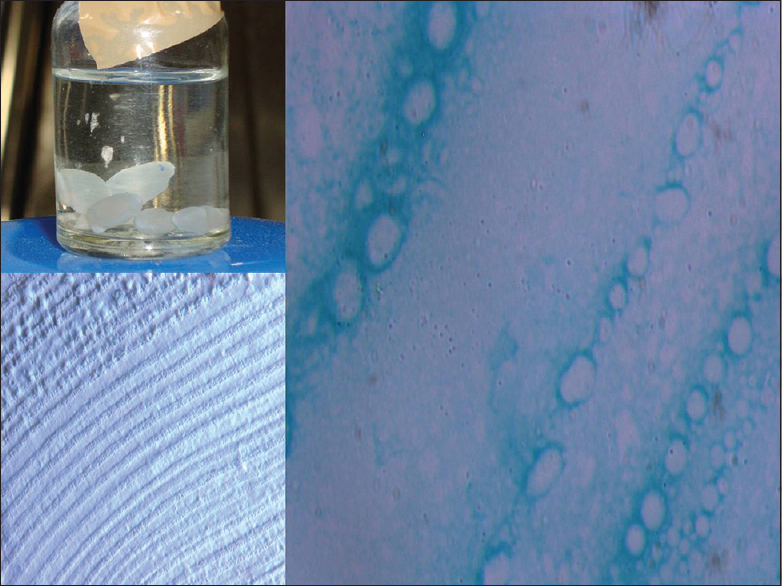 Acanthamoeba can be demonstrated in Giemsa, periodic acid-Schiff, and methylene blue, and 0.1% calcofluor white stain can be used with fluorescent microscopy to see the double-walled organism. Culture can be done with the help of nonnutrient agar with an overlay of Escherichia More Details coli. Polymerase chain reaction for Acanthamoeba ribosomal small subunit RNA is a rapid and simple method to detect it in epithelial corneal specimen. Very few investigators have reported the association of Giardia with eye infection. Ocular manifestations may be secondary to hypersensitivity reaction to Giardia antigen because the parasite has never been found in extraintestinal tissue. Anterior uveitis, choroiditis, and retinal pigment changes are thought to be some of the manifestations of Giardia infection. Parasitic diseases are prevalent in various parts of the globe, and specific isolation of these organisms is important for parasitologists, microbiologists, and pathologists. Ocular parasites are important as they cause severe damage to the external and internal structures of the eye. In certain parasitic infestation, removal of the live worm is important because killing of these parasites by antimicrobial agents can incite severe intraocular inflammation and infection such as endophthalmitis.,,, The authors have demonstrated a unique method of detecting the live parasites under the compound microscope objectives and documenting them digitally. The entire internal structures can be seen under background illumination by trained ocular pathologists and microbiologists, and immediate diagnosis can be communicated to the surgeons. This method adopted by the authors takes only 5 - 10 minutes to diagnose live ocular parasites. Proper diagnoses of ophthalmic parasites can save vision and lives. Therefore, appropriate coordination between clinicians, pathologists, and parasitologists needed for better and effective management of ocular parasites. We would like to acknowledge Sri Kanchi Sankara Health and Educational Foundation. Nimir AR, Saliem A, Ibrahim IA. Ophthalmic parasitosis: A review article. Interdiscip Perspect Infect Dis 2012;2012:587402. Rathinam SR, Annamalai R, Biswas J. Intraocular parasitic infections. Ocul Immunol Inflamm 2011;19:327-36. Peak E, Hoffmann KF. Cross-disciplinary approaches for measuring parasitic helminth viability and phenotype. An Acad Bras Cienc 2011;83:649-62. Behnke MJ. A Text Book of Parasites; Immunity and Pathology. Philadelphia: Taylor and Francis; 1990. p. 1-6. Henderly DE, Genstler AJ, Smith RE, Rao NA. Changing patterns of uveitis. Am J Ophthalmol 1987;103:131-6. McCannel CA, Holland GN, Helm CJ, Cornell PJ, Winston JV, Rimmer TG. Causes of uveitis in the general practice of ophthalmology. UCLA Community-Based Uveitis Study Group. Am J Ophthalmol 1996;121:35-46. Bonfioli AA, Orefice F. Toxoplasmosis. Semin Ophthalmol 2005;20:129-41. Rao NA, Font RL. Toxoplasmic retinochoroiditis: Electron-microscopic and immunofluorescence studies of formalin-fixed tissue. Arch Ophthalmol 1977;95:273-7. Israelski DM, Remington JS. Toxoplasmosis in the non-AIDS immunocompromised host. Curr Clin Top Infect Dis 1993;13:322-56. Da Mata AP, Orefice F. Toxoplasmosis. In: Lampert R, DiBerardino C, editors. Diagnosis and Treatment of Uvietis. Philadelphia: W.B. Saunders Company; 2002. p. 385-99. Sharma SD, Hofflin JM, Remington JS. In vivo recombinant interleukin 2 administration enhances survival against a lethal challenge with Toxoplasma gondii. J Immunol 1985;135:4160-3. Yap G, Pesin M, Sher A. Cutting edge: IL-12 is required for the maintenance of IFN-gamma production in T cells mediating chronic resistance to the intracellular pathogen, Toxoplasma gondii. J Immunol 2000;165:628-31. Yanoff M, Sassani JW. Ocular Pathology. 6 th ed. Philadelphia: Elsevier Inc.; 2009. p. 88. Borkowski PK. New trends in ocular toxoplasmosis - The review. Przegl Epidemiol 2001;55:483-93. Nijhawan R, Bansal R, Gupta N, Beke N, Kulkarni P, Gupta A. Intraocular cysts of Toxoplasma gondii in patients with necrotizing retinitis following periocular/intraocular triamcinolone injection. Ocul Immunol Inflamm 2013;21:396-9. El-Ashram S, Yin Q, Barta JR, Khan J, Liu X, Suo X. Immunoproteomic technology offers an extraordinary diagnostic approach for Toxoplasma gondii infection. J Microbiol Methods 2015;119:18-30. Watts E, Zhao Y, Dhara A, Eller B, Patwardhan A, Sinai AP. Novel approaches reveal that Toxoplasma gondii bradyzoites within tissue cysts are dynamic and replicating entities in vivo. MBio 2015;6:1155-215. Freitas-Neto CA, Cao JH, Oréfice JL, Costa RA, Oréfice F, Lee J, et al. 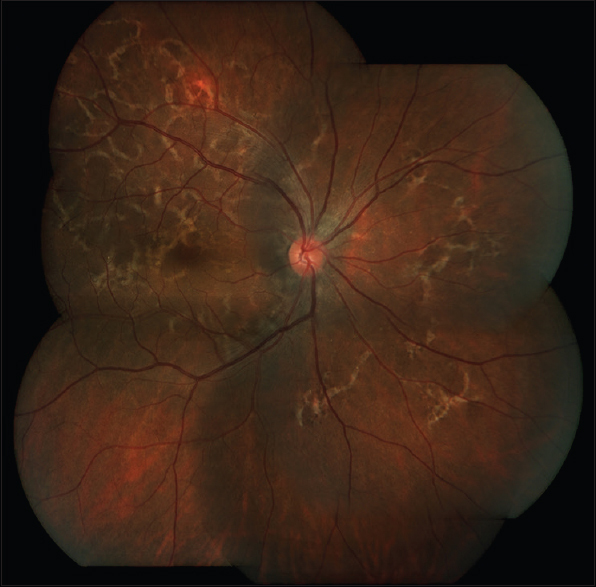 Increased submacular choroidal thickness in active, isolated, extramacular toxoplasmosis. Ophthalmology 2016;123:222-4.e1. Hegde S, Relhan N, Pathengay A, Bawdekar A, Choudhury H, Jindal A, et al. Coexisting choroidal neovascularization and active retinochoroiditis-an uncommon presentation of ocular toxoplasmosis. J Ophthalmic Inflamm Infect 2015;5:22. Dent JH, Nichols RL, Beaver PC, Carrera GM, Staggers RJ. Visceral larva migrans; with a case report. Am J Pathol 1956;32:777-803. Rangel TR, Foster CS. Ocular toxocariasis. In: Lampert R, DiBerardino C, editors. Diagnosis and Treatment of Uvietis. Philadelphia: W.B. Saunders Company; 2002. p. 428-36. Jee D, Kim KS, Lee WK, Kim W, Jeon S. Clinical features of ocular toxocariasis in adult Korean patients. Ocul Immunol Inflamm 2016;24:207-16. Jiménez-Balderas FJ, García-Jaimes J, Ríos R, Zonana-Nacach A, Tapia-Romero R, Villanueva N, et al. Isolation of IgG antibodies to Toxocara in ankylosing spondylitis patients with acute anterior uveitis. Korean J Ophthalmol 2014;28:207-12. Ahn SJ, Woo SJ, Hyon JY, Park KH. Cataract formation associated with ocular toxocariasis. J Cataract Refract Surg 2013;39:830-5. Shields CL, Schoenberg E, Kocher K, Shukla SY, Kaliki S, Shields JA. Lesions simulating retinoblastoma (pseudoretinoblastoma) in 604 cases: Results based on age at presentation. Ophthalmology 2013;120:311-6. Das D, Deka S, Islam S, Deuri N, Deka P, Deka AC. 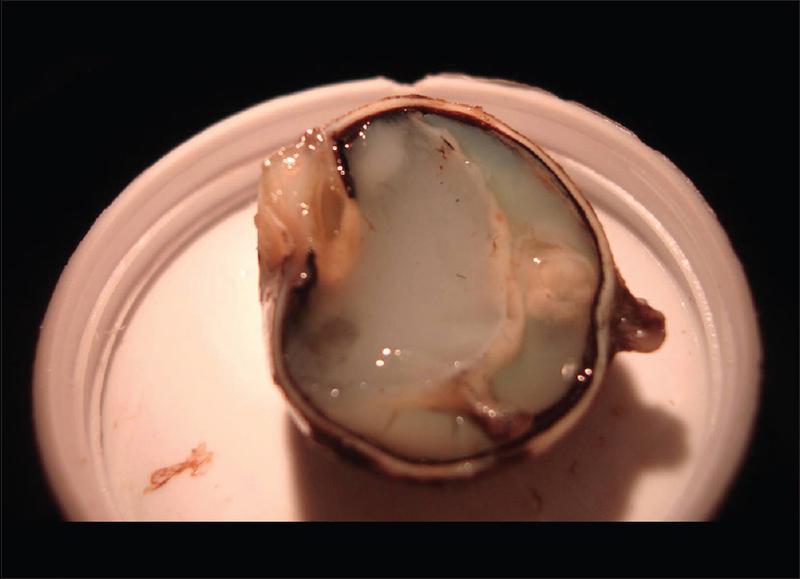 Neuro and intraocular cysticercosis: A clinicopathological case report. Eye Brain 2010;2:39-42. Hogan MJ, Zimmerman LE. Ophthalmic Pathology - An Atlas and Textbook. 2 nd ed. Philadelphia: W.B. Saunders Company; 1962. Li JJ, Zhang LW, Li H, Hu ZL. Clinical and pathological characteristics of intraocular cysticercosis. Korean J Parasitol 2013;51:223-9. Singh J, Singh R. Submacular parasite masquerading as posterior pole granuloma. Case Rep Ophthalmol Med 2015;2015:910383. Mulla MA, Banker AS, Rishi E, Biswas J. Degenerated intravitreal cysticercus cyst masquerading as endogenous endophthalmitis. Ocul Immunol Inflamm 2012;20:378-80. Mahendradas P, Biswas J, Khetan V. Fibrinous anterior uveitis due to cysticercus cellulosae. Ocul Immunol Inflamm 2007;15:451-4. Rodger FC. The pathogenesis and pathology of ocular onchocerciasis. Am J Ophthalmol 1960;49:104-35.
WHO Expert Committee. Report of a WHO Expert Committee on Onchocerciasis Control. Technical Report Series No. 752. Geneva: WHO; 1987. Chan CC, Li Q, Brezin AP, Whitcup SM, Egwuagu C, Otteson EA, et al. Immunopathology of ocular onchocerciasis 3. Th-2 helper T cells in the conjunctiva. Ocul Immunol Inflamm 1993;1:71-8. Van der Lelij A, Doekes G, Hwan BS, Vetter JC, Rietveld E, Stilma JS, et al. Humoral autoimmune response against S-antigen and IRBP in ocular onchocerciasis. Invest Ophthalmol Vis Sci 1990;31:1374-80. Globisch D, Moreno AY, Hixon MS, Nunes AA, Denery JR, Specht S, et al. Onchocerca volvulus-neurotransmitter tyramine is a biomarker for river blindness. Proc Natl Acad Sci U S A 2013;110:4218-23. Barua P, Sharma A, Hazarika NK, Barua N, Bhuyan S, Alam ST. A rare case of ocular onchocerciasis in India. Southeast Asian J Trop Med Public Health 2011;42:1359-64. Yanoff M, Sassani JW. Ocular Pathology. 6 th ed. Philadelphia: Elsevier Inc.; 2009. p. 92. Touil-Boukoffa C, Sancéau J, Tayebi B, Wietzerbin J. Relationship among circulating interferon, tumor necrosis factor-alpha, and interleukin-6 and serologic reaction against parasitic antigen in human hydatidosis. J Interferon Cytokine Res 1997;17:211-7. Kiratli H, Bilgiç S, Oztürkmen C, Aydin O. Intramuscular hydatid cyst of the medial rectus muscle. Am J Ophthalmol 2003;135:98-9. Murthy R, Honavar SG, Vemuganti GK, Naik M, Burman S. Polycystic echinococcosis of the orbit. Am J Ophthalmol 2005;140:561-3. Barney NP. Diffuse unilateral subacute neuroretinitis. In: Lampert R, DiBerardino C, editors. Diagnosis and Treatment of Uvietis. Philadelphia: W.B. Saunders Company; 2002. p. 475-9. Wilder HC. Nematode endophthalmitis. Trans Am Acad Ophthalmol Otolaryngol 1950;55:99-109. Gass JD, Braunstein RA. Further observations concerning the diffuse unilateral subacute neuroretinitis syndrome. Arch Ophthalmol 1983;101:1689-97. Goldberg MA, Kazacos KR, Boyce WM, Ai E, Katz B. Diffuse unilateral subacute neuroretinitis. Morphometric, serologic, and epidemiologic support for Baylisascaris as a causative agent. Ophthalmology 1993;100:1695-701. Gomes AH, Garcia CA, Segundo Pde S, Garcia Filho CA, Garcia AC. Optic coherence tomography in a patient with diffuse unilateral subacute neuroretinitis. Arq Bras Oftalmol 2009;72:185-8. Vezzola D, Kisma N, Robson AG, Holder GE, Pavesio C. Structural and functional retinal changes in eyes with DUSN. Retina 2014;34:1675-82. Vedantham V, Vats MM, Kakade SJ, Ramasamy K. Diffuse unilateral subacute neuroretinitis with unusual findings. Am J Ophthalmol 2006;142:880-3. Das D, Islam S, Bhattacharjee H, Deka A, Yambem D, Tahiliani PS, et al. Parasitic diseases of zoonotic importance in humans of northeast India, with special reference to ocular involvement. Eye Brain 2014;6:1-8. Bhattacharjee H, Das D, Medhi J. Intravitreal gnathostomiasis and review of literature. Retina 2007;27:67-73. Basak SK, Sinha TK, Bhattacharya D, Hazra TK, Parikh S. Intravitreal live Gnathostoma spinigerum. Indian J Ophthalmol 2004;52:57-8. Biswas J, Gopal L, Sharma T, Badrinath SS. Intraocular Gnathostoma spinigerum. Clinicopathologic study of two cases with review of literature. Retina 1994;14:438-44. Maleewong W, Sithithaworn P, Tesana S, Morakote N. Scanning electron microscopy of the early third-stage larvae of Gnathostoma spinigerum. Southeast Asian J Trop Med Public Health 1988;19:643-7. Anantaphruti M, Setasubun P, Daengsvang S, Vajrasthira S. Electron microscopy of the advanced third-stage larvae of Gnathostoma spinigerum. Southeast Asian J Trop Med Public Health 1982;13:531-40. Kean BH, Sun T, Ellsworth RM, editors. Opthalmomysiasis. In: Color Atlas/Text of Ophthalmic Parasitology. New York: Igaku-Shoin; 1991. p. 105. Glasgow BJ. Ophthalmomyiasis. In: Pepose JS, Holland GN, Wilhelmus KR, editors. Ocular Infection and Immunity. St. Louis: CV Mosby; 1995. p. 1505. Rapoza PA, Michels RG, Semeraro RJ, Green WR. Vitrectomy for excision of intraocular larva (Hypoderma species). Retina 1986;6:99-104. Berenji F, Hosseini-Farash BR, Marvi-Moghadam N. A case of secondary ophthalmomyiasis caused by Chrysomya bezziana (Diptera: Calliphoridae). J Arthropod Borne Dis 2014;9:125-30. Choi W, Kim GE, Park SH, Shin SE, Park JH, Yoon KC. First report of external ophthalmomyiasis caused by Lucilia sericata Meigen in a healthy patient without predisposing risk factors. Parasitol Int 2015;64:281-3. Alsaif N, Liao S, Tse DT. External ophthalmomyiasis due to Dermatobia hominis masquerading as orbital cellulitis. Ophthal Plast Reconstr Surg 2016;32:e113-6. Pather S, Botha LM, Hale MJ, Jena-Stuart S. Ophthalmomyiasis Externa: Case Report of the Clinicopathologic Features. Int J Ophthalmic Pathol 2013;2:10. Choudhary P, Rathore MK, Dwivedi P, Lakhtakia S, Chalisgaonkar C, Dwivedi A. Red eye: Rule out Ophthalmomyiasis too. Indian J Ophthalmol 2013;61:293-5. Das D, Das K, Islam S, Bhattacharjee K, Bhattacharjee H, Das SM, et al. A rare case of anterior chamber dirofilariasis. Oman J Ophthalmol 2015;8:50-3. Pauly M, Biswas J, Hussain RN, Anantharaman G. Periocular dirofilariasis mimicking lacrimal sac mucocoele. Orbit 2013;32:324-6. Agarwal M, Biswas J. Live intraocular Dirofilaria causing multifocal choroiditis. Retin Cases Brief Rep 2009;3:228-9. Sangwan VS. Ascariasis. In: Lampert R, DiBerardino C, editors. Diagnosis and Treatment of Uveitis. Philadelphia, USA: W.B. Saunders Company; 2002. p. 437-42. Balasubramaniam M, Sudhakar P, Subhashini M, Srinivasan S, Padma M, Chopra V. Ascaris lumbricoides in the lacrimal passage. Indian J Ophthalmol 2000;48:53-4. Roy FH. Ocular Syndrome and Systemic Diseases. 5 th ed. New Delhi: Jaypee Brothers; 2014. Elsdondew R, Freedman L, Kaplan CS. A worm in the eye; a familiar parasite in an unusual situation. S Afr Med J 1956;30:791-2. El-Shabrawi Y. Loiasis. In: Lampert R, DiBerardino C, editors. Diagnosis and Treatment of Uvietis. Philadelphia: W.B. Saunders Company; 2002. p. 463-7. Tyagi P, Asensio M, Bekir OA, Jabir M. Subconjunctival Loa loa. BMJ Case Rep 2011;2011. pii: Bcr0620103075. Osuntokun O, Olurin O. Filarial worm (Loa loa) in the anterior chamber. Report of two cases. Br J Ophthalmol 1975;59:166-7. Toussaint D, Danis P. Retinopathy in generalized loa-loa filariasis. A clinicopathological study. Arch Ophthalmol 1965;74:470-6. Lymie S, Bruckner G, Bruckner DA. Diagnostic Medical Parasitology. 3 rd ed. Washington: ASM Press; 1997. Veraldi S, Bottini S, Currò N, Gianotti R. Leishmaniasis of the eyelid mimicking an infundibular cyst and review of the literature on ocular leishmaniasis. Int J Infect Dis 2010;14 Suppl 3:e230-2. Couture S, Agrawal R, Woods K, Lockwood D, Pavesio CE, Addison PK. A case of panuveitis with hypopyon due to presumed ocular leishmaniasis in a HIV patient. J Ophthalmic Inflamm Infect 2014;4:21. Zadeh MM, Manshai K, Shaddel M, Oormazdi H. Ocular leishmaniasis. Iran J Ophthalmol 2006;19:1-5. Oliveira-Neto MP, Martins VJ, Mattos MS, Pirmez C, Brahin LR, Benchimol E. South American cutaneous leishmaniasis of the eyelids: Report of five cases in Rio de Janeiro State, Brazil. Ophthalmology 2000;107:169-72. Biswas J, Mani B, Bhende M. Spontaneous resolution of bilateral macular haemorrhage in a patient with Kala-azar. Eye (Lond) 2000;14(Pt 2):244-6. Rathinam SR, Usha KR, Rao NA. Presumed trematode-induced granulomatous anterior uveitis: A newly recognized cause of intraocular inflammation in children from South India. Am J Ophthalmol 2002;133:773-9. Rathinam S, Fritsche TR, Srinivasan M, Vijayalakshmi P, Read RW, Gautom R, et al. An outbreak of trematode-induced granulomas of the conjunctiva. Ophthalmology 2001;108:1223-9. Hidayat AA, Nalbandian RM, Sammons DW, Fleischman JA, Johnson TE. The diagnostic histopathologic features of ocular malaria. Ophthalmology 1993;100:1183-6. Biswas J, Fogla R, Srinivasan P, Narayan S, Haranath K, Badrinath V. Ocular malaria. 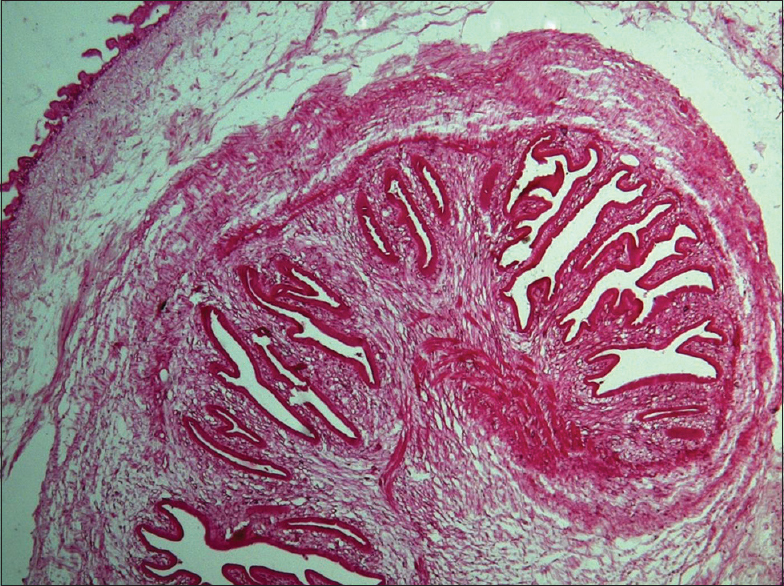 A clinical and histopathologic study. Ophthalmology 1996;103:1471-5. Beare NA, Taylor TE, Harding SP, Lewallen S, Molyneux ME. Malarial retinopathy: A newly established diagnostic sign in severe malaria. Am J Trop Med Hyg 2006;75:790-7. Malla OK. Endophthalmitis Probably Caused by Tussock Moth. In: Report of the Proceedings of the First National Seminar of Prevention of Blindness; 1978. p. 44. Upadhyay MP, Rai NC, Ogg JE, Shrestha BR. Seasonal hyperacute panuveitis of unknown etiology. Ann Ophthalmol 1984;16:38-44. Kathil P, Biswas J, Gopal L. Demonstration of varicella zoster virus in a case of presumed seasonal hyperacute panuveitis. Indian J Ophthalmol 2005;53:270-2. Frangie JP, Moore MB. Parasitic infection including Acanthamoeba. In: Leibowitz HM, Waring Go 3 rd , editors. Corneal Disorder: Clinical Diagnosis and Management. Philadelphia: W.B. Saunders Company; 1988. p. 719. Rutzen AR, Moore MB. Parasitic infection. In: Kaufman HE, Barrron BA, McDonald MB, editors. The Cornea. Woburn, MA: Butterworth-Heineman; 1998. p. 311. Lehmann OJ, Green SM, Morlet N, Kilvington S, Keys MF, Matheson MM, et al. Polymerase chain reaction analysis of corneal epithelial and tear samples in the diagnosis of Acanthamoeba keratitis. Invest Ophthalmol Vis Sci 1998;39:1261-5. Corsi A, Nucci C, Knafelz D, Bulgarini D, Di Iorio L, Polito A, et al. Ocular changes associated with Giardia lamblia infection in children. Br J Ophthalmol 1998;82:59-62. Carroll ME, Anast BP, Birch CL. Giardiasis and uveitis. Arch Ophthalmol 1961;65:775-8.